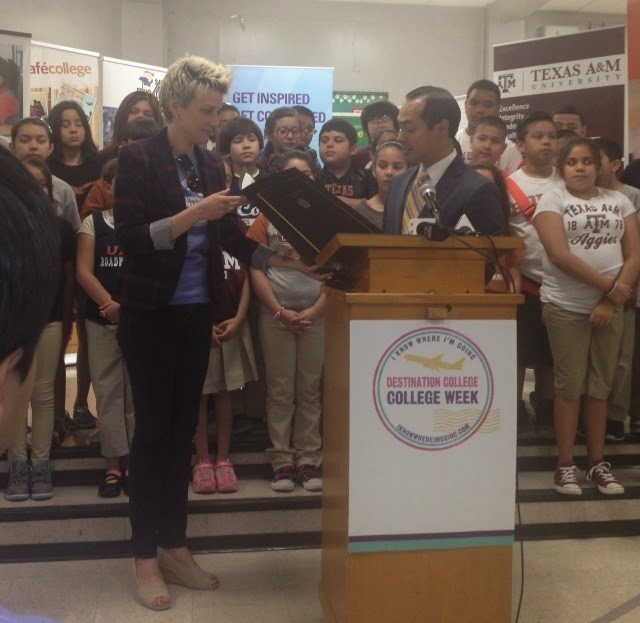 This morning I attended a press conference to kick off College Week in San Antonio. About 25 adorably proud students from Briscoe Academy stood up straight and tall, all dressed in their college t-shirts behind the Mayor while he read aloud a proclamation for the week ahead. The Superintendent of San Antonio Independent School District was also there and he talked about how every kid can go to college, but they have to be told that the opportunity awaits them. They need to hear it from the supportive adults in their lives. Unfortunately, though, so many youth today are growing up without positive one-to-one support and guidance from adults. We all know that this is exactly what they need in order to reach adulthood successfully, but it's by no means a given. Every successful adult can identify the role models and mentors who helped him or her navigate the challenges of childhood, but every prisoner can describe the lack of positive role models or worse, a surfeit of bad role models in their lives. Without this critical adult support, youth fall prey to destructive cycles of poverty, failure, abuse, neglect, teen pregnancy, gang violence, substance abuse, truancy and juvenile delinquency. As I have written about in the past, I'm lucky to work for an organization that helps fill the gap; having a Big Brother or Big Sister has been proven in volumes of research to stop these cycles. These results are what spur our organizational leadership to grow the BBBS mentoring program to the point that every student who needs or wants a Big Brother or Big Sister is able to get one, immediately. On my way out of the press conference this morning I saw this bulletin board and I had to snap a quick picture because isn't it the truth! ?